We may earn a commission when you buy through links on our site. As an Amazon Associate we earn from qualifying purchases. Affiliate Disclosure. Our oldest, Dora, is a female feral cat, and used to be very scared of people. She would always get into my backyard workshop and hide. I would close the garage door in the evenings and inadvertantly close her up in there without knowing. Well one time she got closed up in there for almost a week during a hot, Southern summer. When I discovered her, she was almost dead. She was in such poor shape that she didn’t have the energy to be afraid of me. I nursed her back to health with some water and milk. After that, she was tame toward me. I guess she knew I saved her life. I named her Dora because she had a fatal attraction to open doors. Our other two cats are Pogo and Pepper. They are brother and sister. We adopted them as tiny kittens. All they have ever known was being locked up in the house as strictly indoor cats. I was afraid to let them out because they did not understand the dangers of being outside. Dora, on the other hand was an adult feral cat when we rescued her, so she was wise to the outdoors. We could let her come and go as she pleased. But this bothered me because the two younger cats so very much wanted to go outside and see the sky, and explore the grass on the ground. They didn’t understand why Dora could go outside but they couldn’t. Well, I finally did something about it. I built a catio. 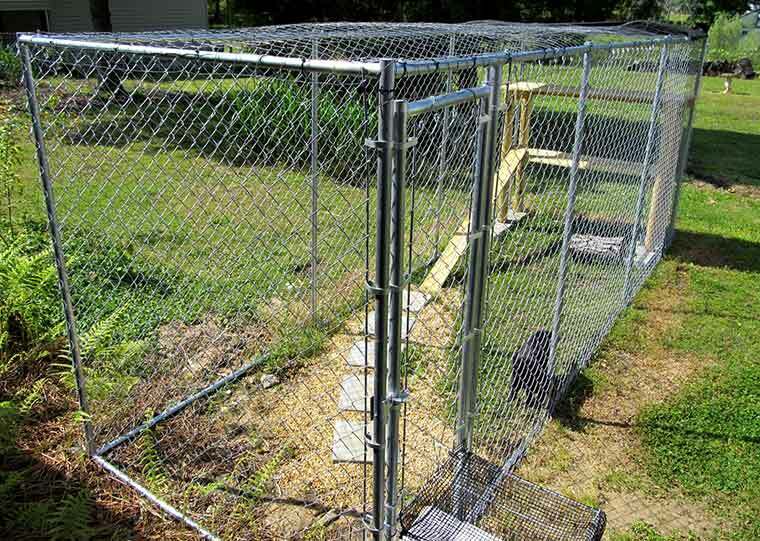 I explored my options and decided that a chain-link kennel kit would be my cheapest and least time-consuming option for building an outdoor cat pen. I put it together by myself but you really need 2 people to do it. If I could do it again, I would go with a different type of enclosure. I am not thrilled with the design of the kennel kit. The fence rails are held together with poor-quality, metric, slotted machine screws. The heads would strip and I couldn’t get the screws tight enough to prevent the rails from slipping apart. Luckily, I already had my own collection of metric machine screws that worked better. This pet door will work on a metal storm door. I also decided to install a pet door in the bottom of the back storm door. I got this pet door because it was the only one I found that would work on the thin, sheet metal door bottom. You may see questions and answers that suggest otherwise, but it will work because I did it. The hardest part is cutting the hole in the sheet metal. I simply used my oscillating multi-tool with a metal-cutting blade that is purchased separately. Once you get the hole cut out properly, the pet door closes down great on the thin sheet metal. 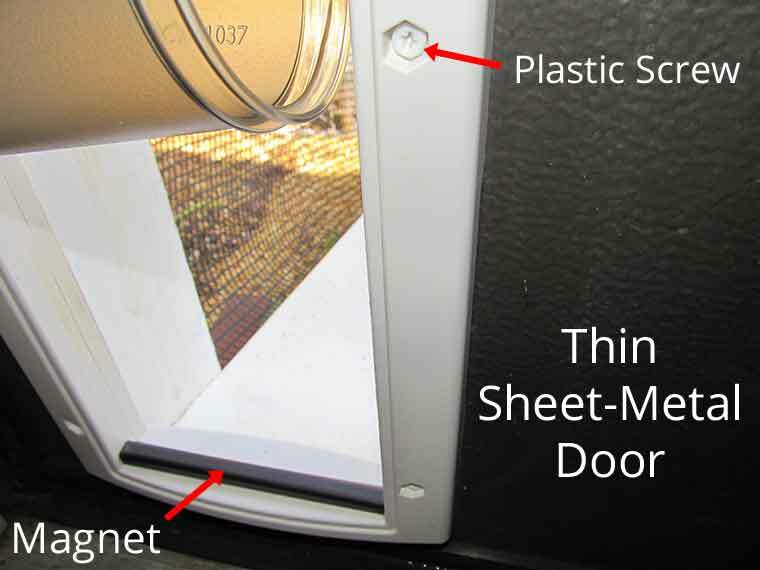 The plastic screws are actually a beneficial feature that allows the door to be adapted to such a thin sheet-metal panel. I am very pleased with this pet door. Notice how this specific pet door completely covers the sharp metal edge of the sheet metal door opening. The magnet holds the flap in place. With a cat door installed in this way, I could control access to the cat door by just opening and closing the inside wood door. I have seen the cat window enclosure designs or pens that use a window for access, but I didn’t have a suitable window available. The kitchen window would have been a possible option, but I didn’t want the cats walking on the kitchen countertops to access the window. The hardest part was figuring out how to build a passage from the pet door to the cat cage. I wanted the catwalk to be in two pieces so that I could easily remove the section next to the door. This way, I could still have access to the back door if I needed it. I ended up building the contraption you see in the photo. I used a treated 2×10 for the catwalk and treated 2x4s for the side posts. One end of the long catwalk just sits up against the storm door. The other end just sits on a paver. It is heavy enough that it doesn’t move. 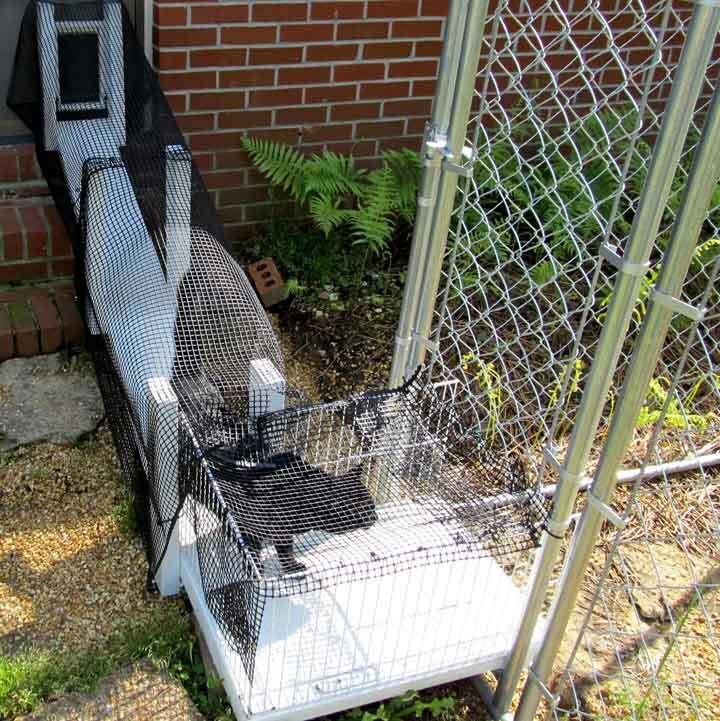 This cat run-catwalk is made of treated wood, a wire shelf, and some inexpensive plastic hardware cloth. I wrapped the frame completely around with plastic hardware cloth. The plastic hardware cloth is held together with black UV-resistant ties. I chose the plastic hardware cloth because the cut ends of metal fencing wire are very sharp and would be dangerous for the cats. There is a transition box between the catwalk and the cat pen. I just used some of my leftover treated lumber to make the base. I also had some leftover wire shelving that I used for the sides. It is hard to see in the photos, but I cut up a spare closet shelf bracket and screwed that down over the wire shelf pieces to hold them down. I used this because it is what I had on hand. A better option would be aluminum flat-bar strips. Aluminum would be easier to drill holes in. I used more of the plastic hardware cloth on top. The only thing holding the catwalk and transition box together is a couple of wire ties to secure the plastic hardware cloth. I can cut these if I need to move it. The transition box just sits inside an opening I made in the kennel gate. I can remove it easily if I need to get inside the cat kennel. I also built an outdoor cat tree to put in the pen. I made it out of landscape timbers and treated fence panels. You must sand everything down really well to prevent splinters. 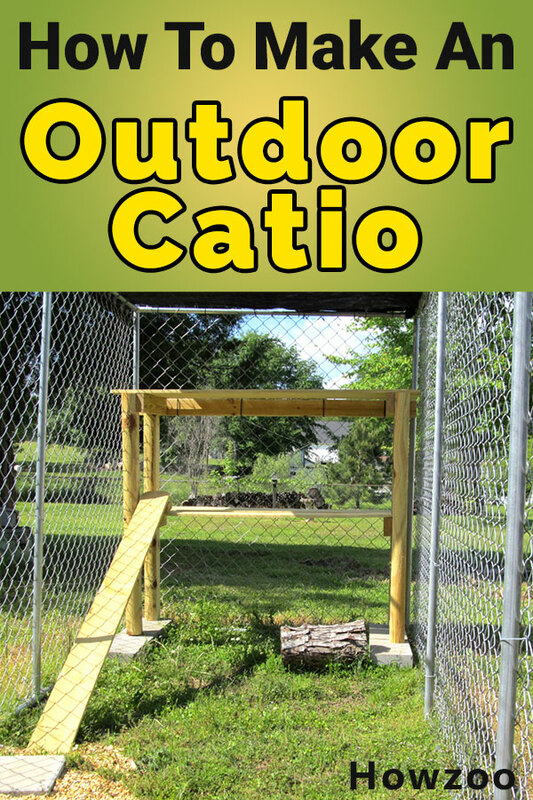 This outdoor cat tree is attached to the fence using some long wire ties. This way it won’t fall over. They love to scratch on the wood timbers. They don’t like to walk on the ground when it is wet, so I put some stepping stones in the pen for them to walk on. They use the stepping stones a lot. I covered the top of the pen with wire fencing secured with the black wire ties. I also put a piece of landscape fabric over the cat tree for shade. I used landscape fabric because it won’t hold water like a tarp would. Pogo loves his cat perch and his outdoor cat pen. He stays out here most of the day. It actually took quite a few tools to build this. Luckily, I already has these things. If you don’t, then this is your excuse to get them. Here is the finished enclsoure. I put stepping stone pavers and pea gravel in the middle for them to walk on. They sit on the pavers when the ground is wet. The top is covered in wire fencing. This cat pen was more work than I expected. If I had to do it again I might just buy one of these outdoor cat enclosures and build a ramp to get it up to the back door. These enclosures have additional attachments that you can add as you go to make a great cat playpen. It even has a cat penthouse available. 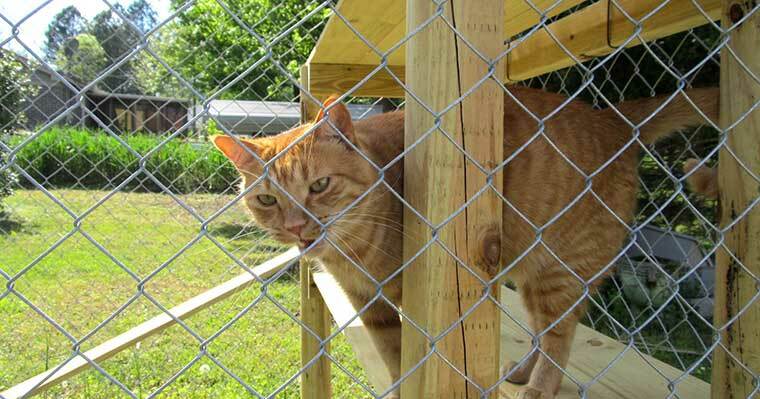 A big benefit of this cat enclosure is that I can move it with me if I buy another house. Another thing to think about is fleas. An open bottom allows them to enjoy the grass, but at the same time makes them susceptible to fleas and ticks. I have been lookng into some type of lawn treatment to control the fleas, but for now I am just using a fipronil treatment on the cats to kill fleas and mites. If you can somehow raise the cat playpen off the ground, I bet you wouldn’t have nearly as much of a flea problem. I would say 80% of the cat’s enjoyment is just being out in the fresh air where they can see and hear the sights and sounds of nature around them. Being in the grass can be added fun, but it can also be bad if they get into a nest of fire ants. If you do choose the bare ground method, just be prepared to do more pest control. Hi there! I wanted to say thank you for posting the process of your outdoor kitty-topia project. My husband and I will be moving to a new house in a few weeks and we plan to build one underneath the deck of the second story porch. The deck has a roof and is screened in so I figure this would be the best place to build an outdoor shelter since it will be covered and dry. Reading this has given me a few ideas that we could use. We have 6 kitties, 5 of which were all feral and have adopted me lol. Anyway, thanks again for the post!! Since this post was written I have modified the cat pen so that it has only 3 sides. The 4th side is the house. This way I can walk out the back door into the cat pen. When I get time I’ll update this post to show my new layout. We do not have a flea problem. However we have ticks, ants, spiders etc. I use human food grade diatomaceous earth. I buy it on amazon. It is safe and effective. Reapply after rain. I still use fiproguard (generic). Great job. I use Cedarcide for flea and other bug control. Smells nice too. I’m researching catios for my friend. She has chain link one side of the house, making it a 3-sided enclosure with the house as the 4th side. However, there is no “top”, so looking into that aspect. Thank you for the tutorial.